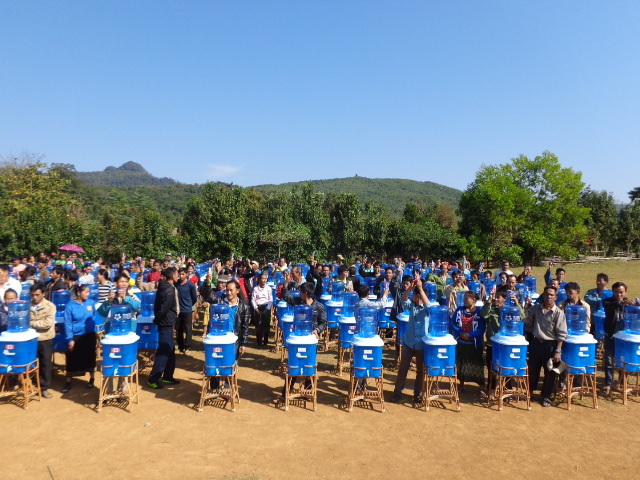 With the much anticipated arrival of friends from British Columbia, Canada, we sent Siphan up ahead to organize the delivery of 250 water filters to four villages. Of course there are always complications. By now we have come to expect the unexpected. The delivery truck left on time, with plenty of time to get here but decided he wanted to spend two nights in Vientiane, rather than one night, despite explicit instructions and agreement. This threw the entire process off. 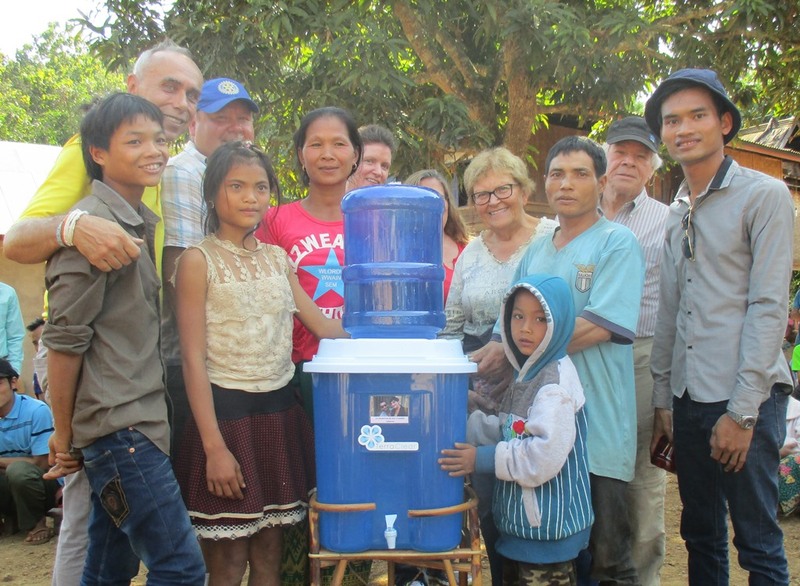 Village chiefs had to be called who in turn had to call all of the people who had left the village to meet up with the truck; the delivery of replacement parts to Luang Prabang had to be cancelled and the final 14 water filters had to be delivered to Siphan’s house in Phonsavanh. The delay further resulted in taking an extra day to deliver everything. Our guests arrived safe and sound and we began the next adventure. 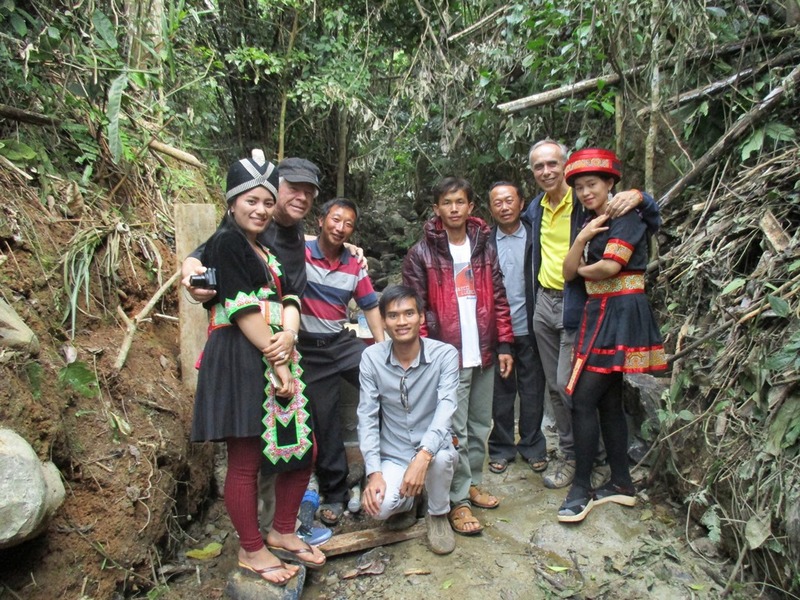 Once we arrived at the drop off site of Pak Jeem, we loaded onto a most uncomfortable tractor and rode through streams, huge ruts and an all out bumpy ride for about an hour. The ladies were on the front of the tractor, men on the back because that is where the engine exhaust headed. We got there pretty late and were never so glad to get off. We would have taken more pictures but it was a balancing act the entire trip and we were facing backwards…rather difficult to watch for tree limbs from that view. After arriving at the village we were surprised to see that Khamdy, who we sponsored during his final years as a university student and as a teacher until he went on payroll) and his brother Somnuek. 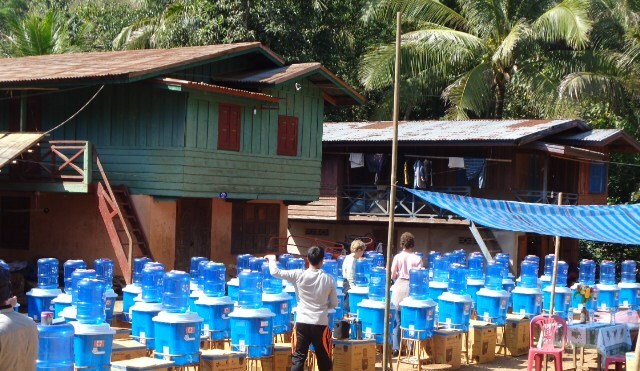 Living in Pak Jeem, they too a motor bike a few hours ahead of us and had all of the water filters set up for us. All we had to do was label them! With 62 systems already set up, I went right into the teaching segment of the program and the audience was amazing and thrilled for a cure to their diarrhea…again, all of them rose there hands when I asked if they had experienced diarrhea recently. installing the labels on the filters. During the training, we used a very specially labelled filter in honour of an Italian friend who lost her brother on New Years in Italy. Normally they would be taking pictures and video instead of me and my amateur efforts. May he rest in peace. We miss you Serena and Massimo. 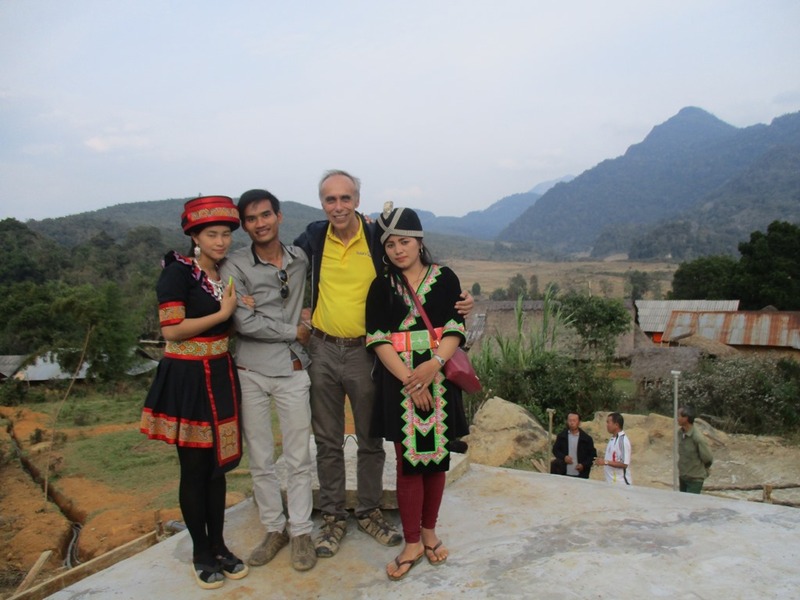 The villagers had a special baci ceremony waiting for us also. This was a first for some of the guests and they felt quite humbled over it, as we did. 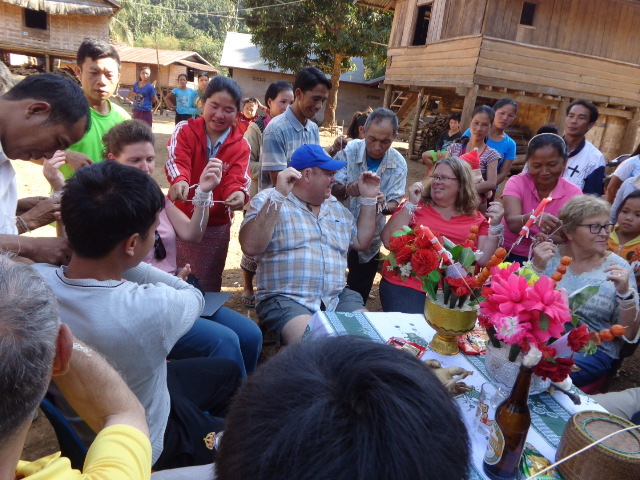 The baci and string ceremony with the villagers wishing us long lives, good health and many other chants. 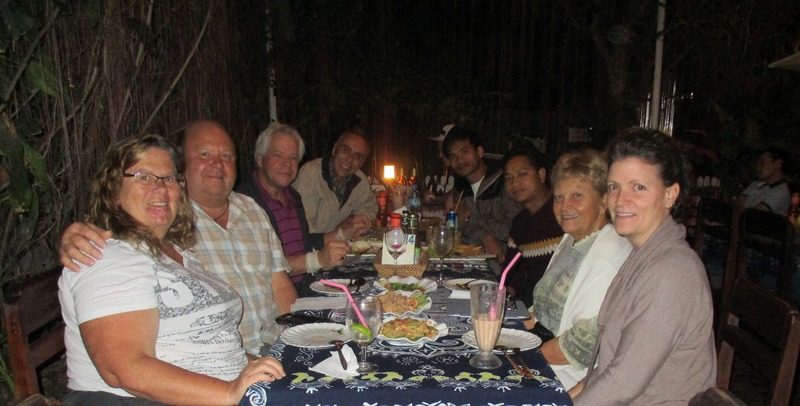 After a rush back to Nong Khiaw for the night, dinner and a sleep, we headed to Vieng Hin. Fortunately we could drive right to the village up and down a dusty, winding road through the mountains. 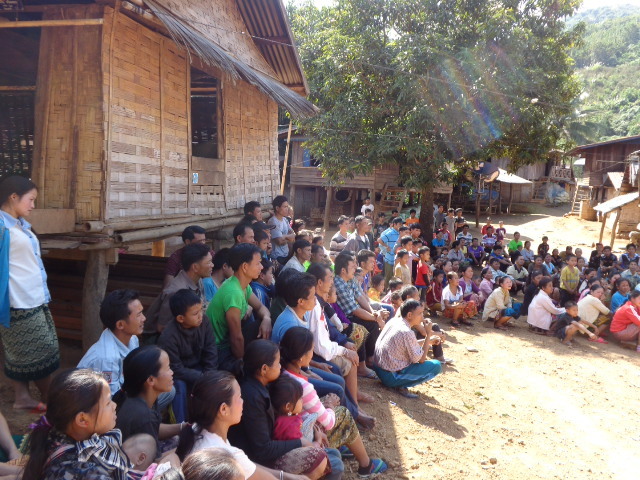 Here we distributed another 137 systems. This gives you an idea of the volume. Here, the villagers (the rest of their large families were waiting on the sidelines) are holding up their toothbrushes and paste to thank our dental hygiene sponsors. We have video too! 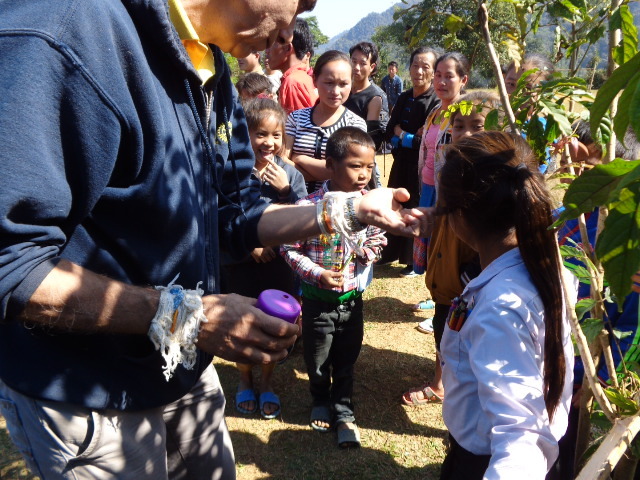 During my demonstrations, I use different coloured sparkles on the hands of the villagers to describe the effects of bacteria spread by sharing water to wash hands. They got the message pretty clearly. Before long, the kids had sparkles on their faces and in their hair. 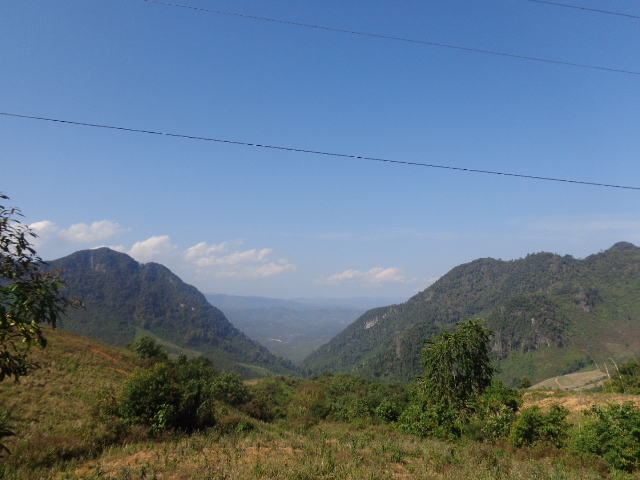 Heading back to Nong Khiaw through the spectacular mountain views. 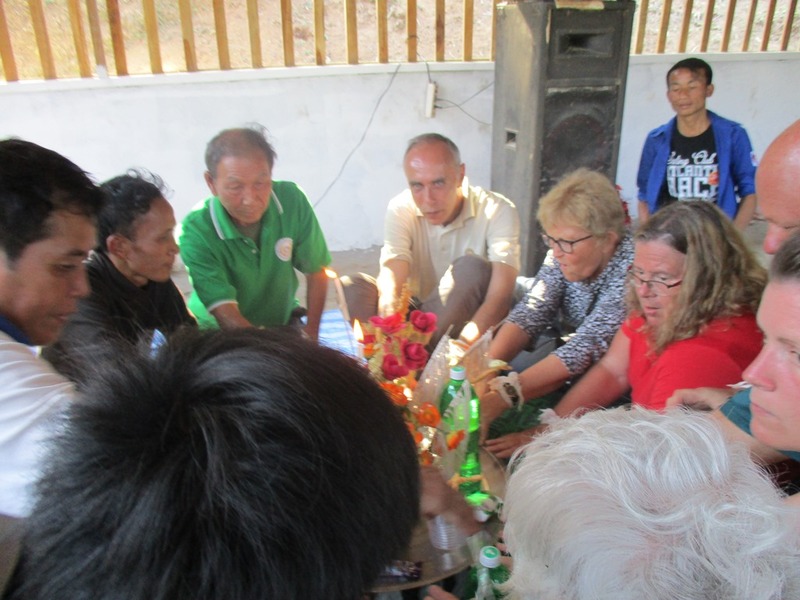 The next morning we stopped off at Siphan’s farm to give our new guests and idea of what farming was like here. 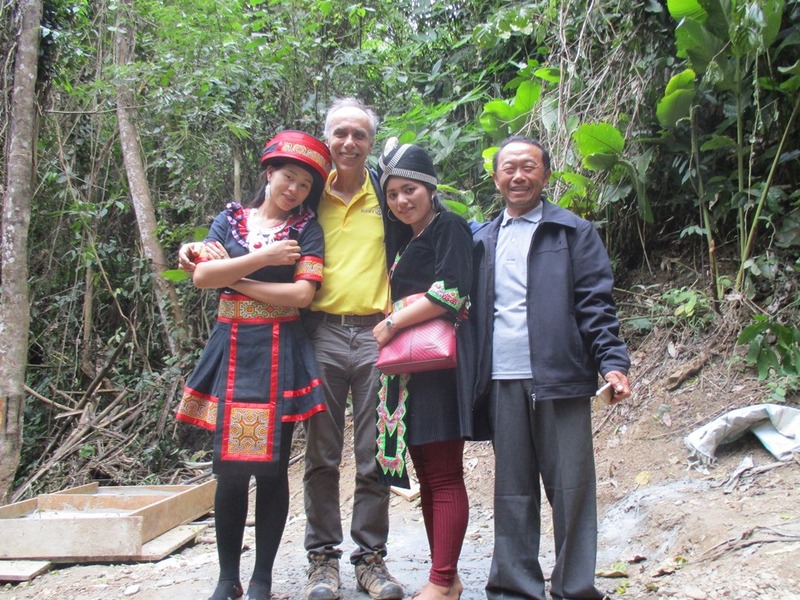 Fortunately we were met with Siphan’s mom and dad and his brother. Tamara was quite interested because she grows chickens on her own…as pets (her words not mine). Feeding the fish. It is dry season so the crops had already been harvested. For our final day of the distribution, we were in for a surprise…not exactly a fun one either. 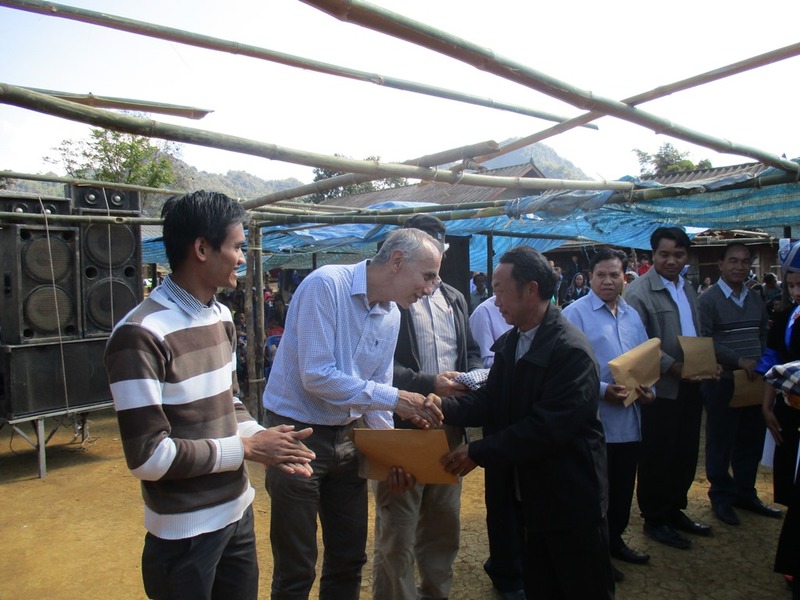 We distributed another 37 systems although more are needed. We couldn’t fit any more filters on the truck so will have to go back and I am not looking forward to it. We thought the first tractor ride was rough. Tht was a piece of cake compared to this one. The ruts in the pathways were massive, plus lots or rocks and I counted 22 rivers and streams that we crossed. It was 1 hr 20 minutes each way by tractor. I thought we would never get there! 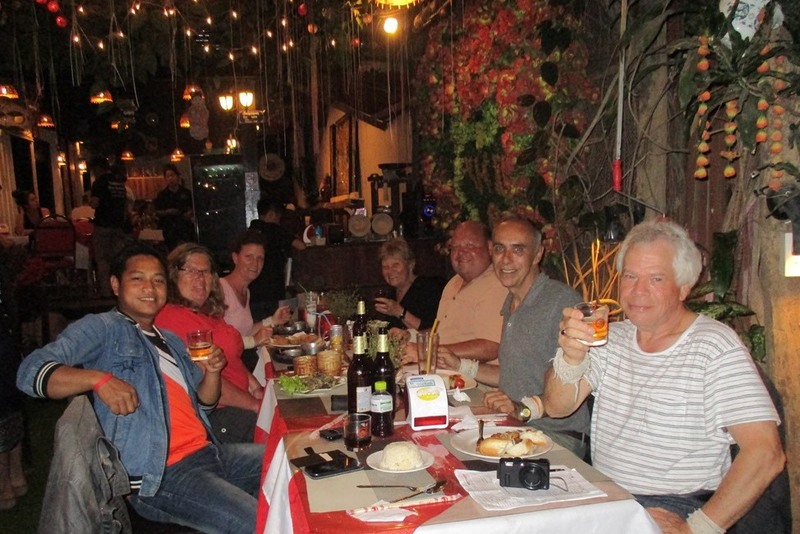 I felt quite bad for our guests but they never complained once and felt that the experience was amazing. Here was our reception when we finally arrived. It is always an emotional experience to see this. They students had spent the morning preparing flower bouquets for us and presented them to us. This is better than a red carpet treatment I think, although I have never been invited onto a red carpet before. 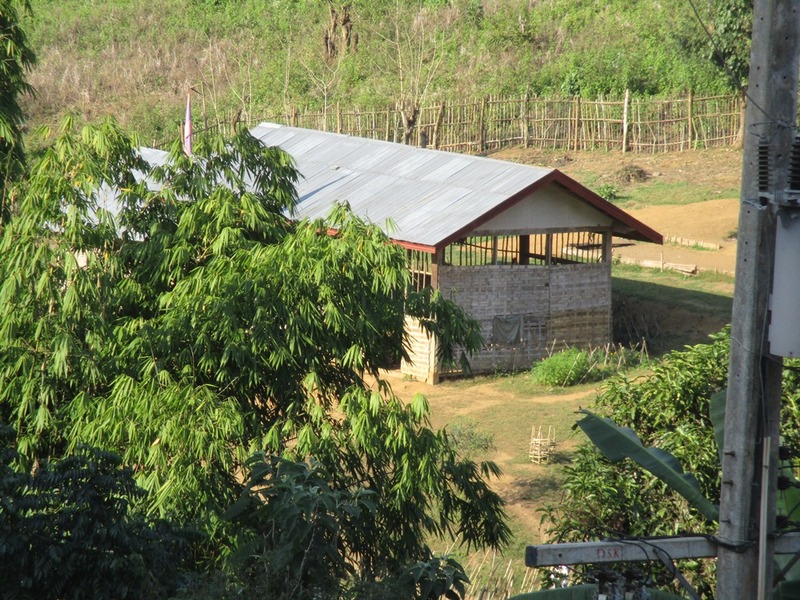 Here are a couple of images of the village and school. 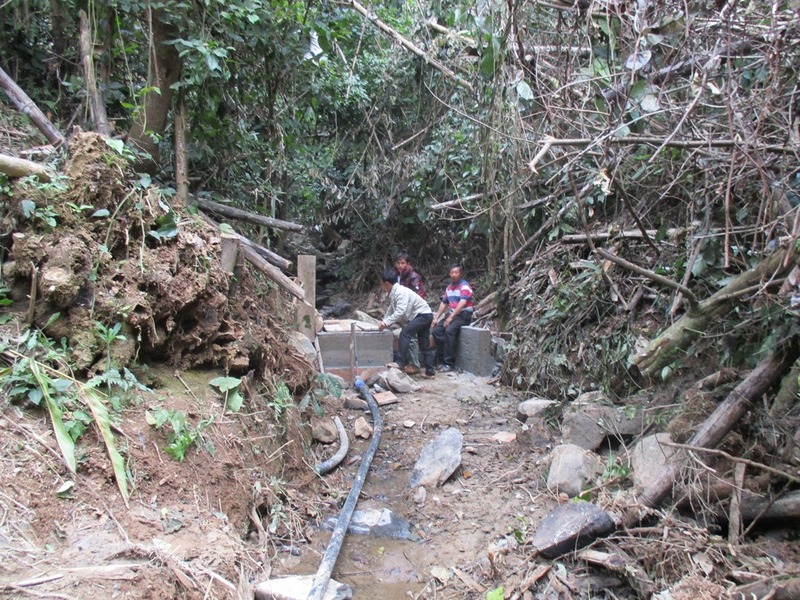 They are desperate to get a reliable source of water. 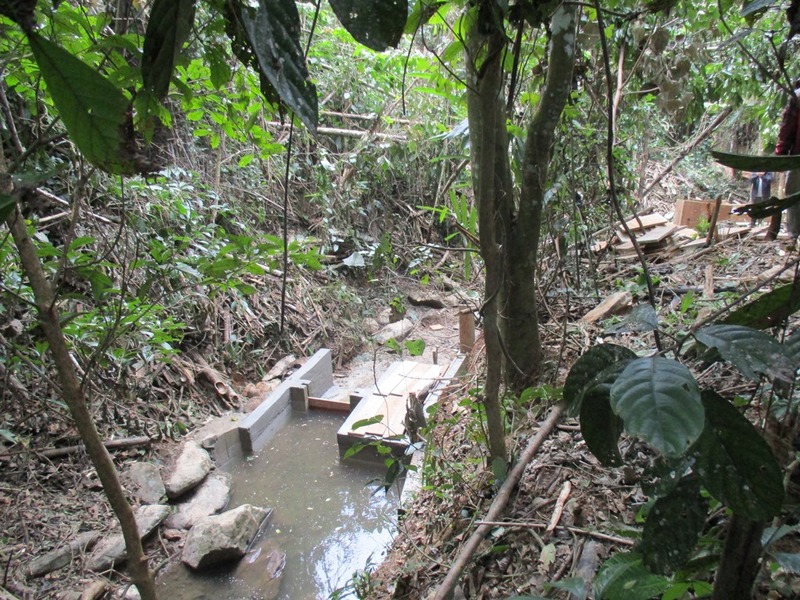 With the dry season upon us, their current source is expected to be dry within the next couple of weeks…and in Canada, we waste more than we use, taking it for granted. 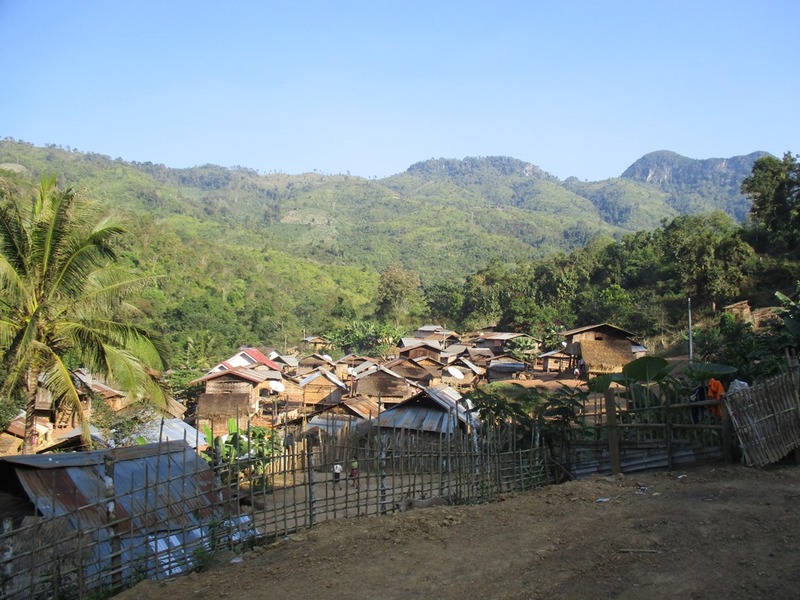 Lung Pha Village. I doubt they get any foreign visitors here. 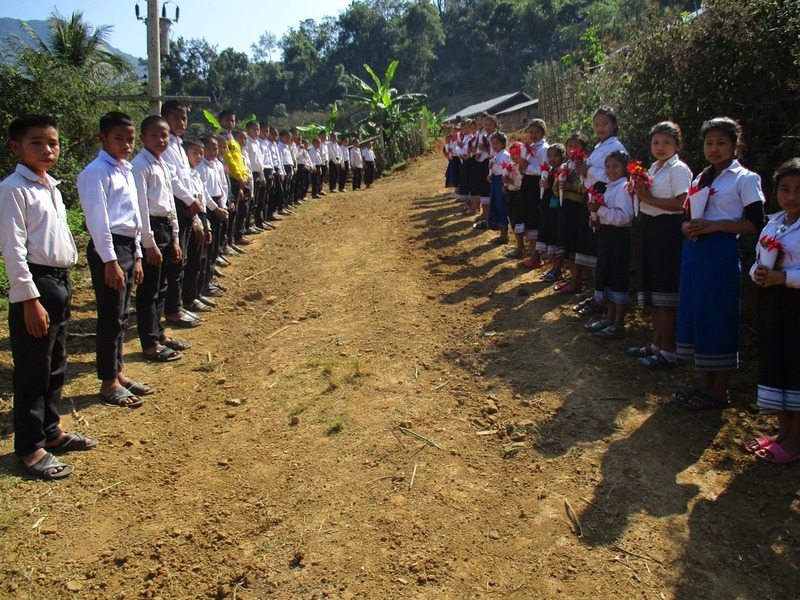 This is their school…just one room and they try to teach 5 grades. 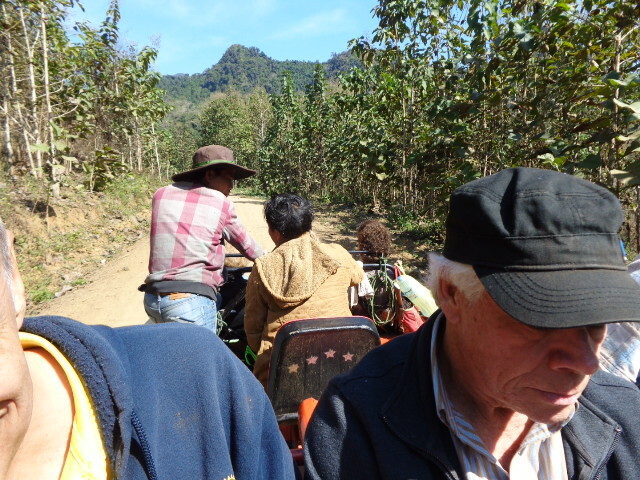 We made it back to Luang Prabang that evening and still, not a complaint…Maybe people in BC are just too polite…LOL I had a tough time sitting down for two days, had bumps, bruises, cuts and welts from the tractor…and I am going to have to do this again! Our farewell dinner. I am so sad to see them go. Diana (at the back on the right) was the one I was most concerned about because I wasn’t sure how the tough ride would affect her, but she presented a poem that she wrote, bringing tears to our eyes. We made Mike read it because he is a tough guy right? This says it all. We have feared no evil. For these are gentle people, the gentlest of people. And softly, softly, they steal your heart away. survive, deep in the caves that sheltered them. And the madness begins again. And perhaps in a way a small amount of wealth. The poinsettia, the Palm and the rubber tree. Our very hearts to please. As many a novice does live to tell. Our time here is now sadly coming to a close and we are going away. Will we come again? You may very well ask. The answer of course is, I don’t believe you could keep us away. Mmmmm….delicious goats blood..NOT! 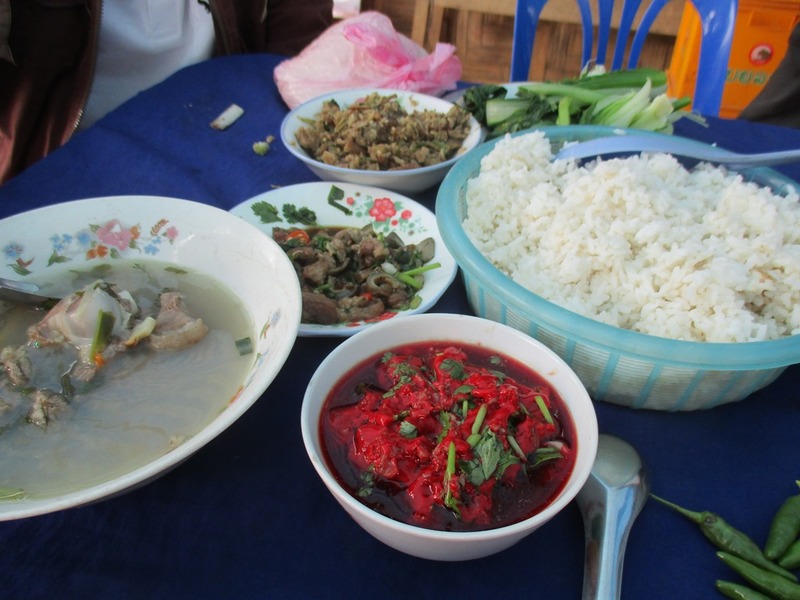 The rest of the dishes include rice of course plus various goat dishes. You will note that in my right hand I just put down the hand sanitizer – since everyone shares with their hands, I took the liberty of giving some to everyone around me…including the governor beside me. My presentation of the pipe wrench to the Governor and on to the chief. 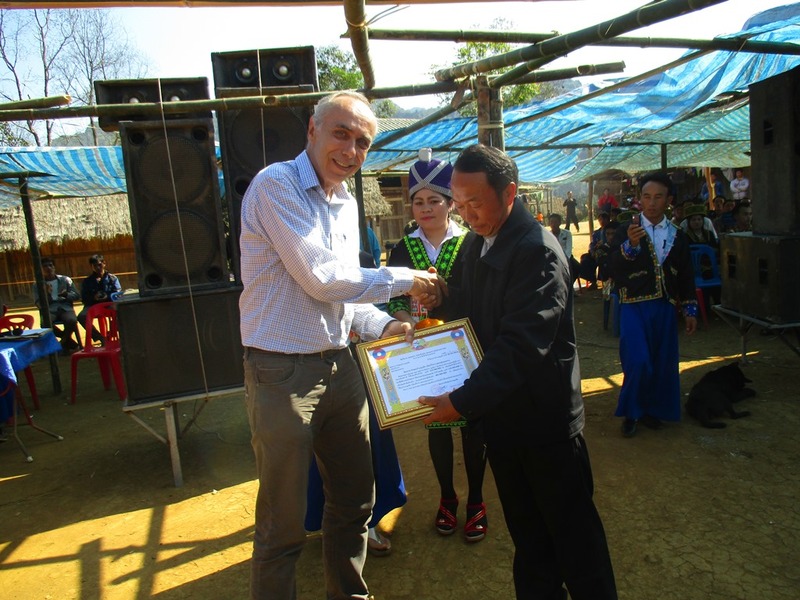 Here I am receiving a framed certificate on behalf of the government with their sincerest thanks for our support. There is a certificte there for Serena and Massimo from Italy also. Unfortunately, they had to return to Italy early due to a very sad and sudden death of Serena’s brother. 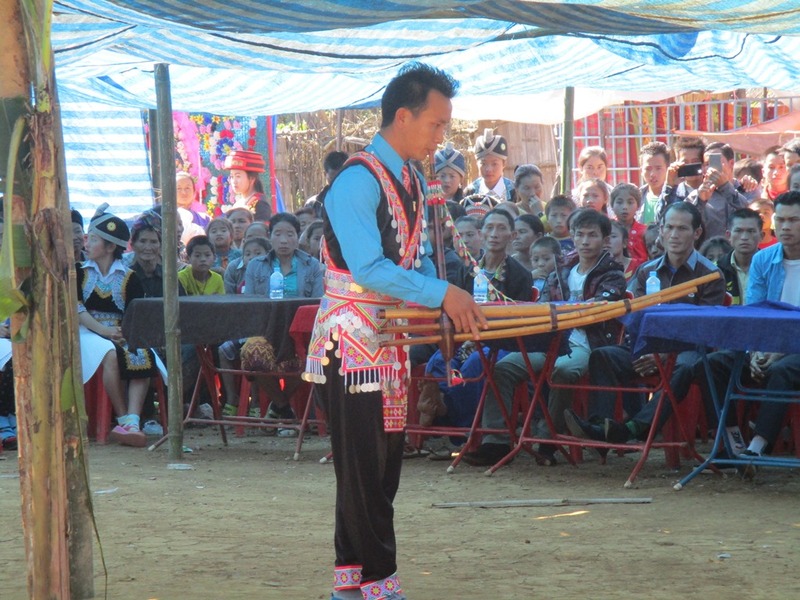 Traditional Hmong dance…quite amazing – wish we understood the story he was telling us through dance. 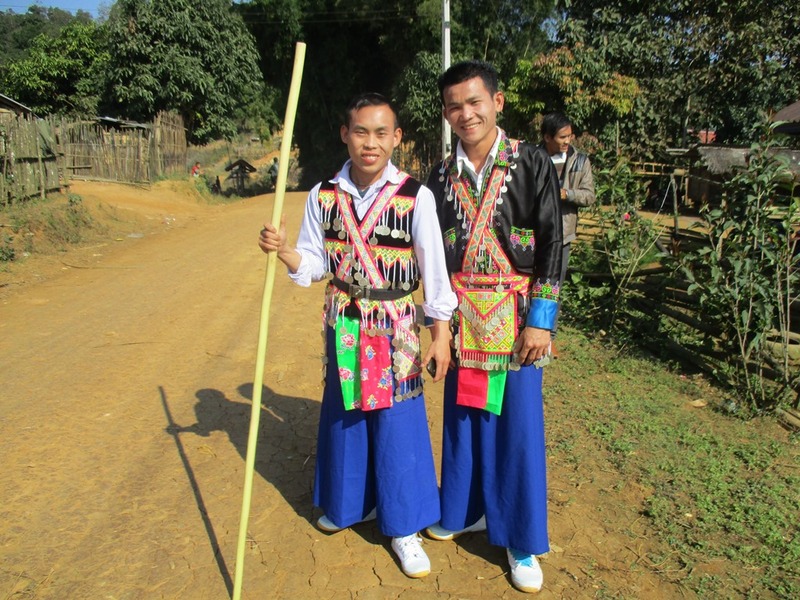 I think the boys represented animals with their horns but the Hmong culture is so different and both the Khmu and Lao people do not understand it. A gift of a beautiful scarf by the chief on behalf of the village. The sign was installed on a temporary basis – the permanent cement posts will be done this week. The sign is located as one enters the village. 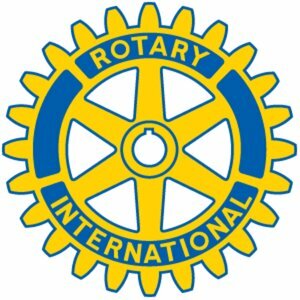 We are so humbled by the support we have received from Rotary Clubs right across the country from Vancouver Yaletown and Coquitlam Sunrise, British Columbia to Lunenburg, Nova Scotia. In addition to the Interact Club of Clarington and the Rotoract Club of DC/UOIT. District 7070 clubs included a matching District Grant and funds from The rotary Clubs of Bowmanville, Whitby Sunrise, Pickering, Ajax, Courtice, Etobicoke, Markham-Unionville, North York, Oshawa Parkwood, Port Hope, Richmond Hill, Scarborough, Scarborough North, Toronto, Toronto West, Whitby and Uxbridge. It is amazing what we can accomplish together! As our avid readers are aware, nothing is ever straightforward and usually difficult at best. So many things can go wrong and usually do BUT I am proud and happy to announce that this project was concluded with only minor hitches along the way. 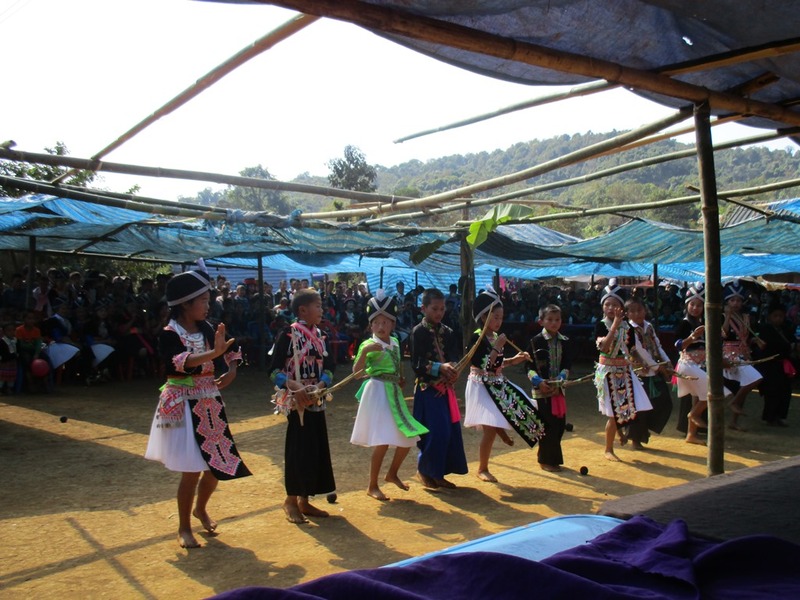 We arrived back in Vieng Hin the day before their celebration of Hmong New Years and the party was pretty much underway. 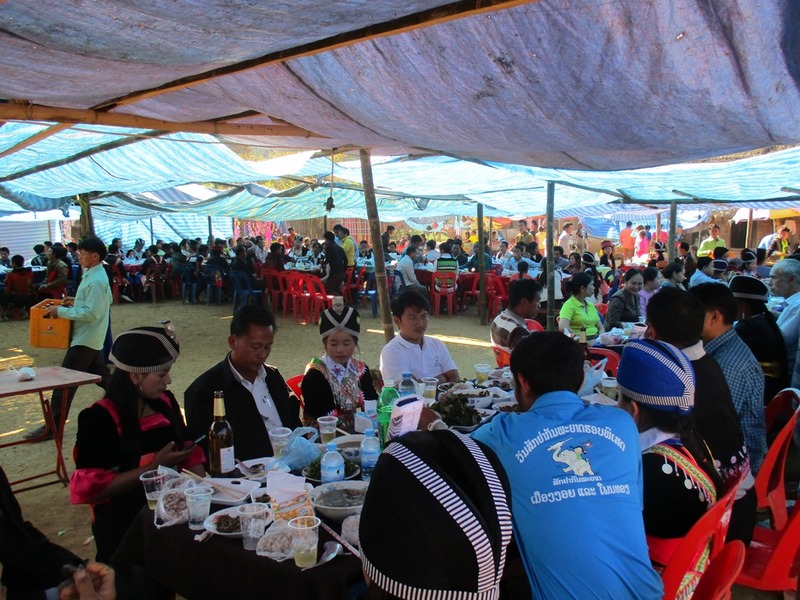 Each village family (137 families) was required to pay 100,000 Kip which is a lot for them, in advance of the celebrations. So on the first day they slaughtered a goat and 2 chickens. A little further into the village we noted the cultural ball toss. 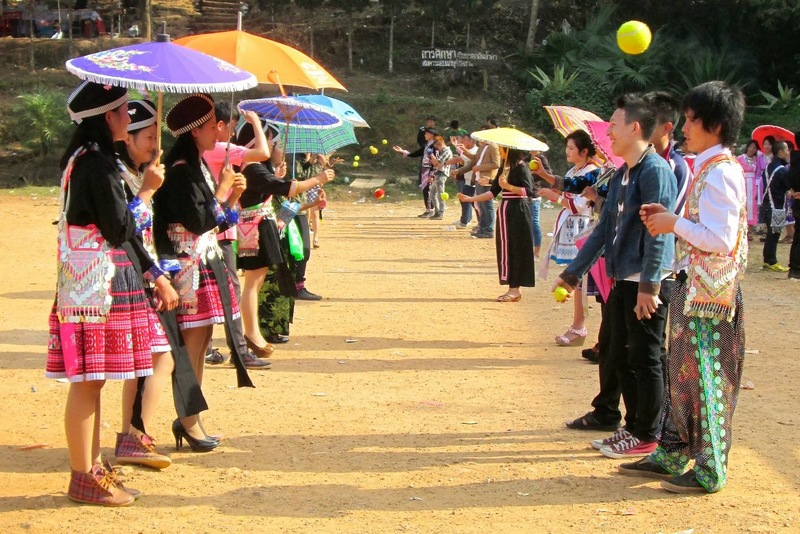 This is a practice whereby the boys and girls, men and women dress up in their colourful traditional outfits and toss a ball back and forth to their hopeful future partners. If someone drops the ball, it is believed that they are not interested in the partner. These days it generally means that that they can’t catch (that would be me). 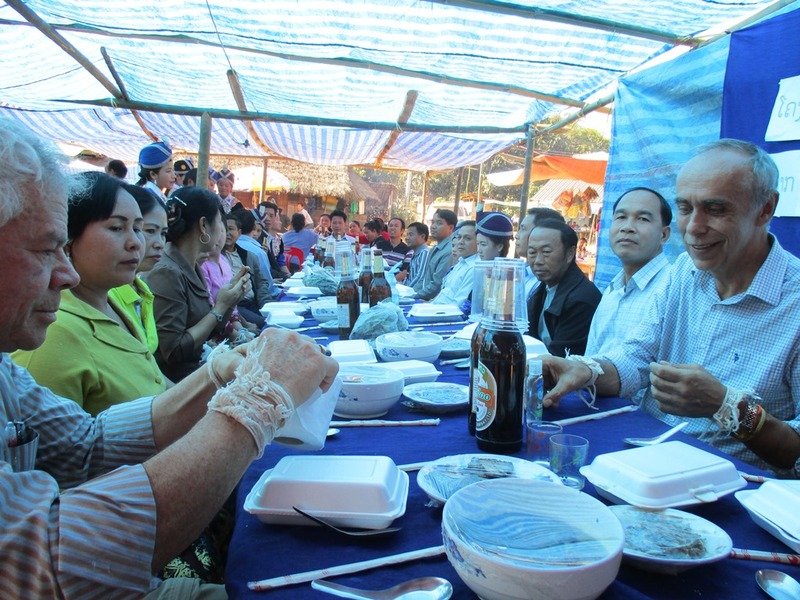 At some point the man/boy invites the girl to drink and eat with them, perhaps take them to see the caves together or the farm where they can spend some quality time together. 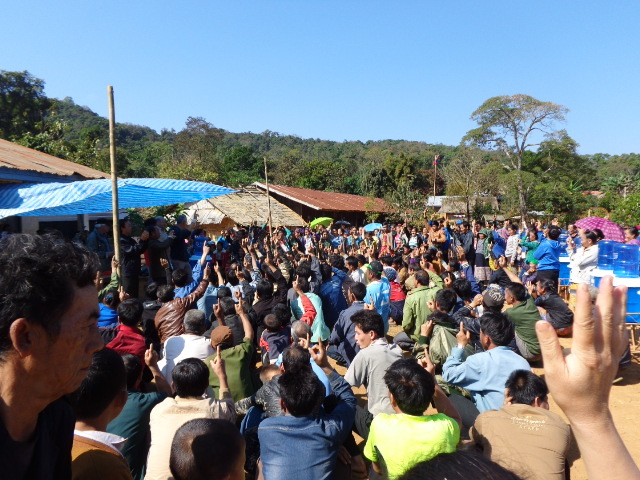 Ball Toss among Hmong villagers. 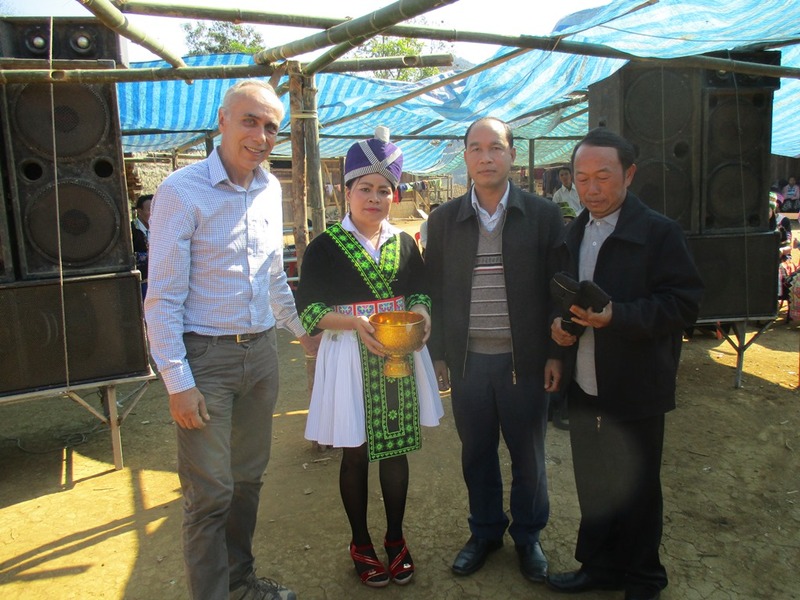 While some Hmong will go all the way with the girl if they want to, it is generally considered sinful and the couple are required to wait a week to see if there are any other takers for the women. This is a nervous time for the couple. 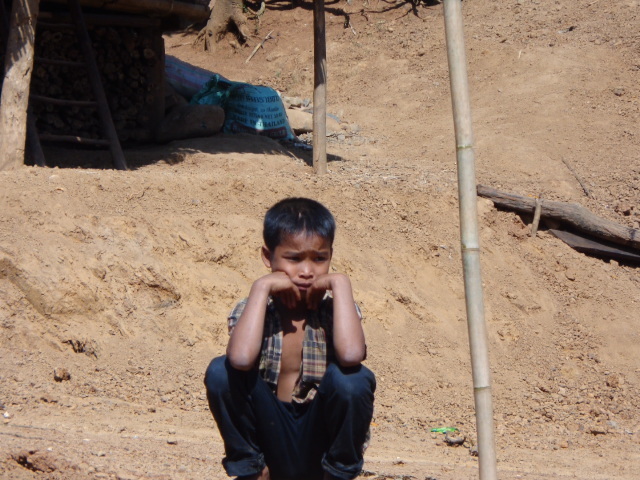 Another Hmong man may visit anytime during that week, usually from a different village, and claim the women. If she isn’t interested, it is simply too bad for the woman because she will get locked into a room until she accepts or until the man feels it is a useless attempt (at least a week). The woman is fed of course. I suspect this doesn’t happen very often any more but it seems unethical. After that is marriage and lots of kids but more about that later. 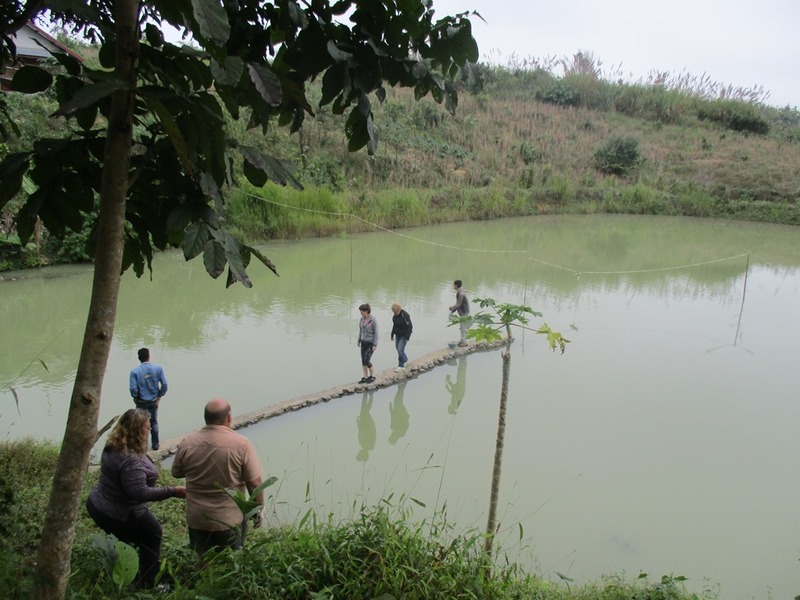 After a short visit we headed to inspect the dam and the water tank. Due to the landscape the dam location was moved about 50 metres to the south of where we thought it was going to be but not a big deal. I should point out that Gary, a good friend from Canada (Richmond Hill) was there also and each of us was assigned a vilage Ambassador. Indeed they were beautiful but we know better than to flirt with them. The girls were certainly flirting with us though. Deb (Gary’s wife), when you see the picture, don’t get too excited…Gary was a perfect gentleman…I might have a couple of pictures though that could be considered as blackmail material (KIDDING). They are getting ready to remove the board…needless to say, we stayed out of the path to avoid getting wet. 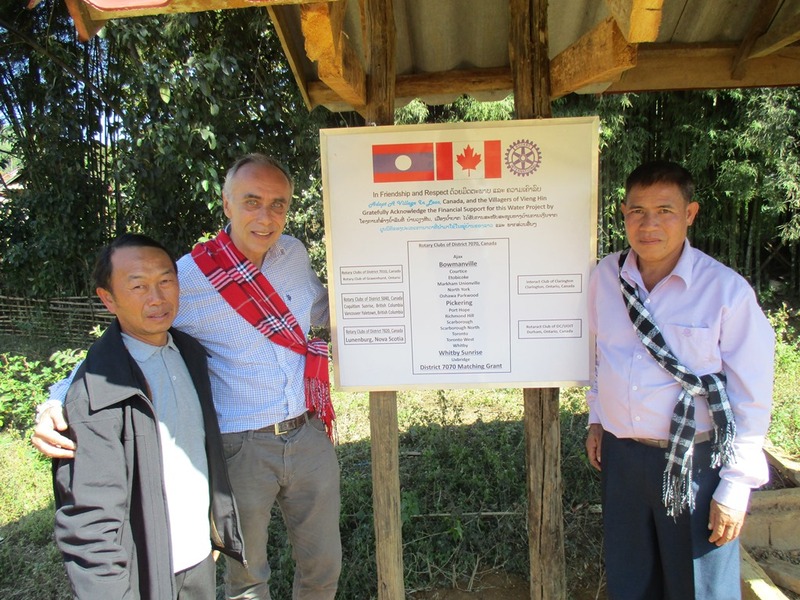 The two village ambassadors and the chief pose for the picture. The lady on the left is 16, in Grade 10 and she is from a family of 11. to my right, thelady is in grade 11 and comes from a family of 17!!! Don’t worry Deb…the lady standing by Gary, was really after me. 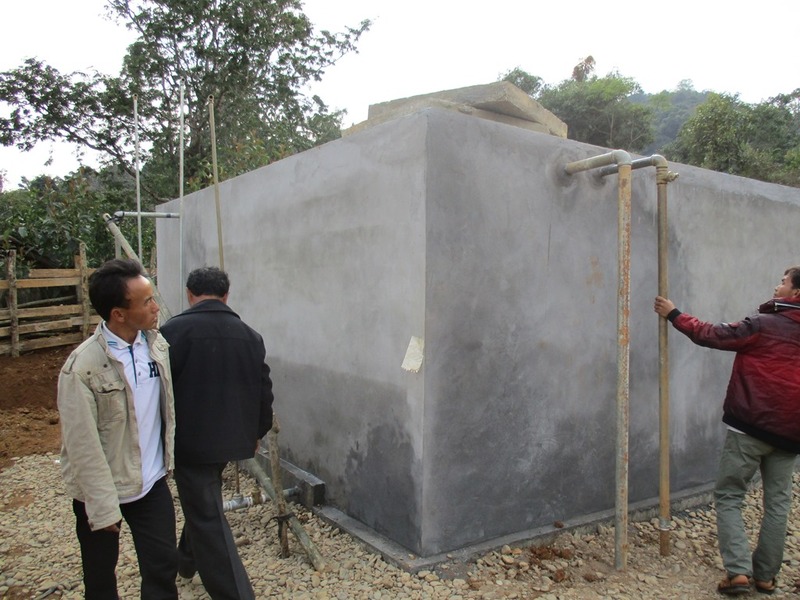 This is one huge tank for 137 families. However, considering the average number of people per family, I should not be surprised. The ladies followed us right up the ladder. We are standing on top of the water tank. 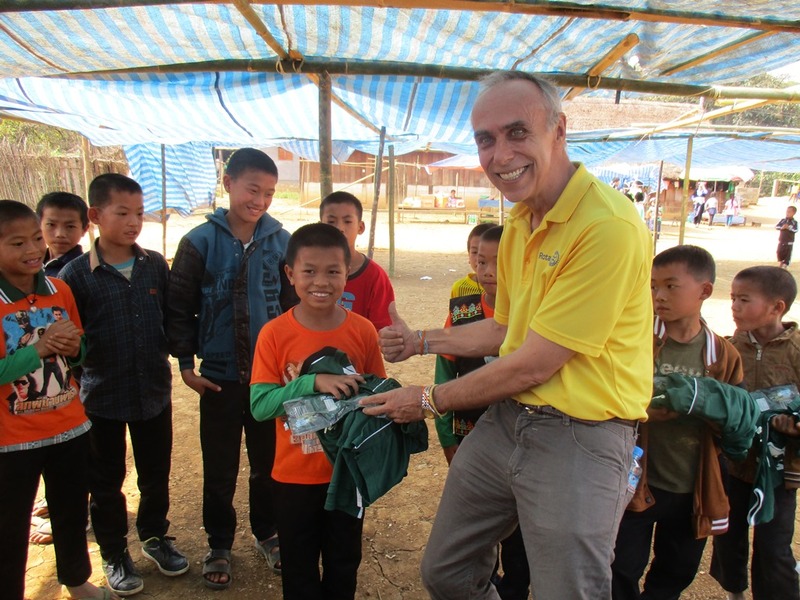 The last task of the day, before heading back to a guest house was to handout uniforms from Afrisoccer who donated them on behalf of Ontario’s Durham Region Sports Clubs. 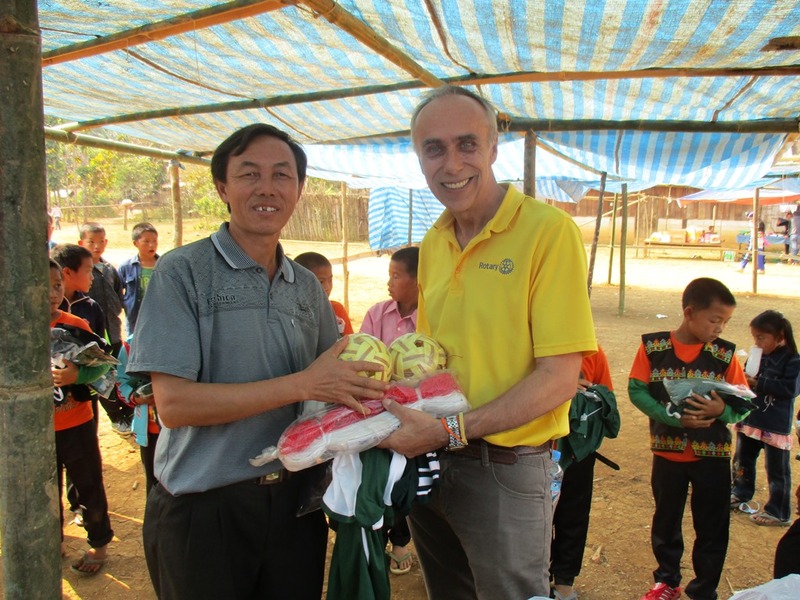 They provided slightly used jerseys, shorts and socks. The one issue with the socks was that only a couple of the players had proper shoes – they usually play barefoot. The soccer field was in use but it didn’t take the team long to dig post holes, put in posts and string a rattan ball net. 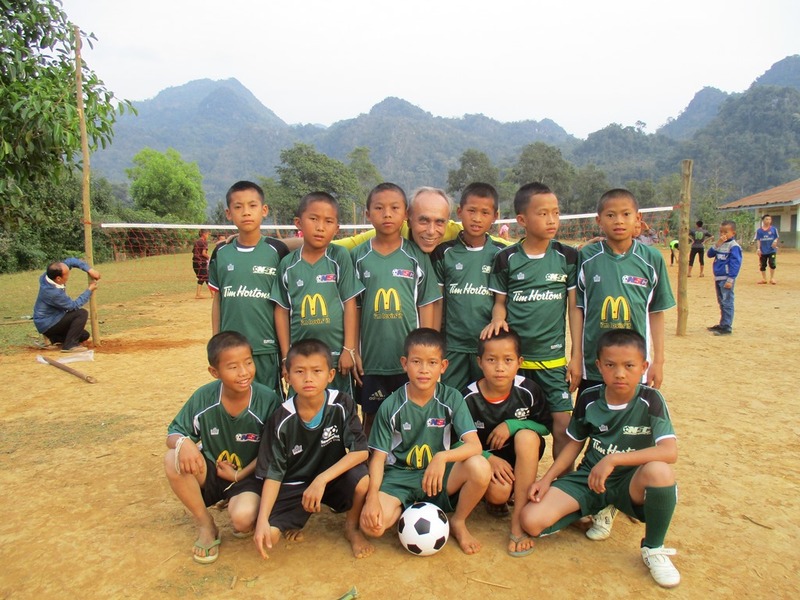 We have video (still needs to be edited) but the kids were pretty nervous playing in front of the Falang (foreigners). These kids are sooooo shy! I had to tickle them to get them to smile for the camera. Here is a preview of my next post.